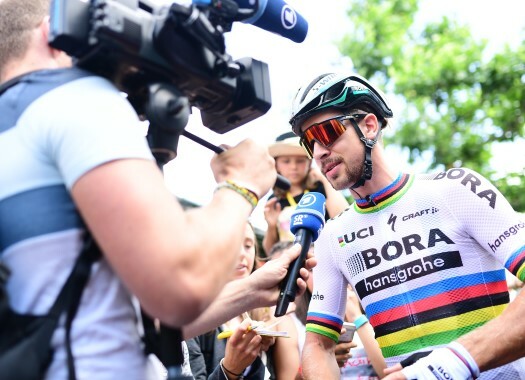 Peter Sagan (Bora-hansgrohe) has taken the victory at the second stage of the Tour de France. The rider was the fastest in a very reduced group that resulted after a last-kilometres crash. The second stage of the French race with its 182.5 kilometres over a flat course, was another big opportunity for the fast men. The racing day started with the escape of Sylvain Chavanel (Direct Energie), Michael Gogl (Trek-Segafredo) and Dion Smith, who built a gap of more than two minutes with the peloton. At around 100 kilometres to go, Chavanel was riding on his own after his two companions decided to drop back and wait for the peloton. The Frenchman got warmly welcomed by the people on the sides of the road and got an advantage of more than four minutes with the peloton. Two riders abandoned on the day, Tsgabu Grmay (Trek-Segafredo) with abdominal pains and Luis Leon Sanchez (Astana) due to a heavy crash. Other riders that crashed on the day were Luke Durbridge, Adam Yates (Mitchelton-Scott), Jesus Herrada (Cofidis) and Silvan Dillier (AG2R La Mondiale). Chavanel was reeled back in by the peloton with 13 kilometres to go and a couple of kilometres later, Marcel Kittel got a puncture and changed his bike, having to chase back to the peloton in the last kilometres. In the intermediate sprint, Geraint Thomas (Team Sky) took a second and increased his advantage in the GC fight. At 1.8 kilometres from the finish line, there was a crash that involved the Yellow Jersey wearer Fernando Gaviria (Quick-Step Floors) as well as Michael Matthews (Sunweb), Daryl Impey (Mitchelton-Scott). The final sprint took place in a small group and Peter Sagan (Bora-hansgrohe) crossed the finish line just ahead of Sonny Colbrelli (Bahrain-Merida) and Arnaud Demare (Groupama-FDJ). With this victory, Sagan took also the Yellow Jersey.